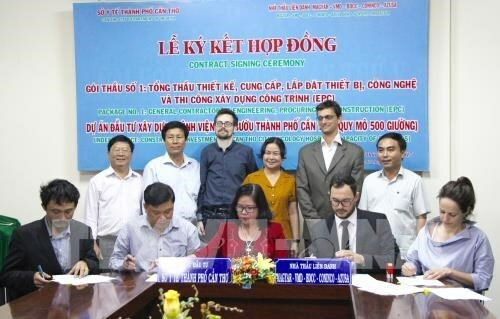 Can Tho (VNA) – The Health Department of the Mekong Delta city of Can Tho signed contracts with a joint venture of five contractors on August 8 to begin construction of the Can Tho Oncology Hospital. The 500-bed hospital will be built by Hungary’s MAGYAR and VMD, Vietnam’s Bach Dang Construction Corporation, Consultant and Inspection Joint Stock Company of Construction Technology and Equipment (CONINCO) and Japan’s AZUSA. It will cost a total of nearly 1.8 trillion VND (79.2 million USD), including nearly 57 million EUR of official development assistance provided by Hungary’s government. The hospital aims to provide services for locals and the Mekong Delta region.